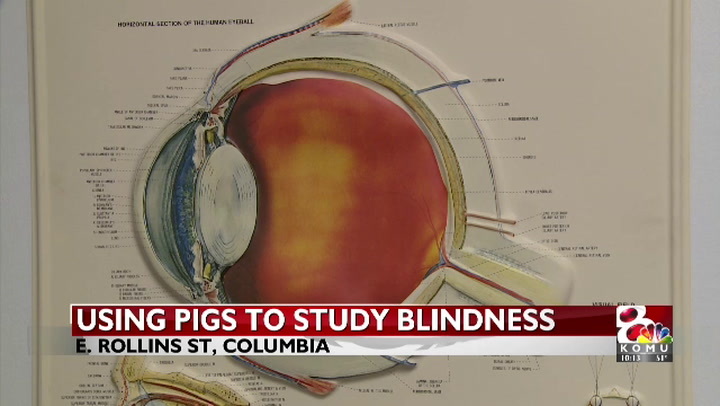 COLUMBIA - MU researchers say there will be 600 million people with some level of diabetic blindness by the year 2040. Diabetic retinopathy is a retinal disease that often cause blindness in adults for 10 or more years. But researchers say they have found the protein that causes the disease. "We found a protein complex called NLRP3 has played a very important role in the progression of the disease," Dr. Shyam Chaurasia, who led the research team. "If you can find a drug which can block or not allow this protein to be expressed, we can actually stop the progression of the disease." The protein causes vessels in the person's eyes to start leaking. If the leakage goes untreated, it will cause complete blindness. Currently, the disease can only be discovered in humans when it has already caused some level of blindness. Chaurasia said they have also discovered similar features of diabetic retinopathy in Ossabaw pigs. They will use the pigs as a model to study various treatments and other mechanisms of the disease. "We can create these animal models and genetically manipulate to see their functionality, as well as similarity to the human eyes and how we can see the progression of the disease in these pigs," he said. Ossabaw pigs are special because they are born with type-2 diabetes and develop diabetic retinopathy without manipulation, according to Chaurasia. Chaurasia said the best way for diabetics to avoid potential issues is to manage and control high sugar intake.